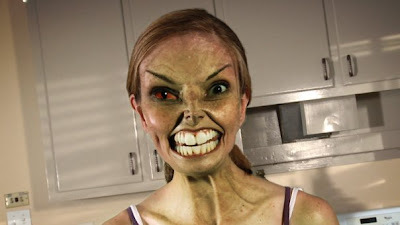 Home » ben pickle , dawn swartz , filmmaking , movies » See Dawn Swartz channel Gollum in BEN PICKLE! See Dawn Swartz channel Gollum in BEN PICKLE! I've written about Dawn Swartz a few times before on this blog: about how she's a very sweet friend and terrific actress! She had one of the leads in our film Schrodinger's Bedroom a few years ago, and recently she was seen briefly alongside Richard Gere in Nights in Rodanthe. Dawn, girl... what did they do to you?! It's like Rick Baker and WETA teamed up to do the makeup on this movie.